Read Illinois State magazine writer Kevin Bersett’s daily journal from his trip to Costa Rica on STATEside. Chicago has the wall-rattling L train. Florence has its church bells. The Costa Rican rain forest has the howler monkey. The loudest of Costa Rica’s four monkey species lets out a distinctive woof, one just as likely to echo through the rain forest at 4 a.m. as at 4 p.m. The canopy-dwelling monkey is heard more than seen. One evening last November as Alexandra Rossi and Illinois State classmate Katilyn Gerstner crossed a suspension bridge on their way to a lab at La Selva Biological Station, a troop of howler monkeys passed overhead. 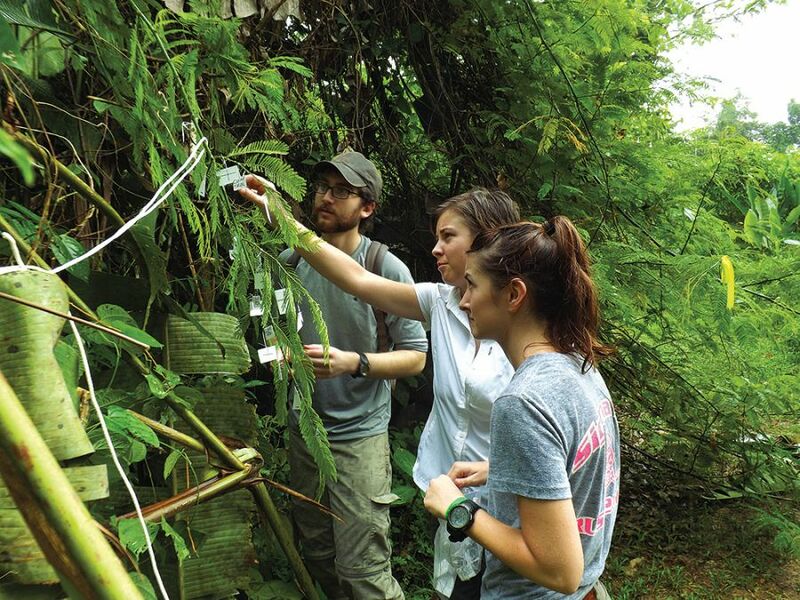 For 10 days over the Thanksgiving break, the 12 students of the School of Biological Sciences’ Rain Forest Ecology class came eyeball-to-eyeball with tropical monkeys, snakes, and ants in one of the liveliest—biologically speaking—places in the world. La Selva, which means “the jungle” in Spanish, is a world-renowned research center and nature reserve in Costa Rica’s Caribbean lowlands. Biology Professor Joseph Armstrong and his colleagues have been bringing students from Illinois cornfields to this 4,000-acre Garden of Eden annually since 1996. Armstrong started the trips after conducting research there in 1993. Biology Professor Joseph Armstrong and Ph.D. biology student Amanda Carter get a closer look at the rain forest at La Selva Biological Station. Even in a country with about 5 percent of the world’s species, La Selva and adjoining Braulio Carillo National Park stand out. The reserve has more than 1,850 plant species, 448 bird species, and 500 ant species. Some of the tropics’ top predators roam this rain forest, including the New World’s largest cat, the jaguar; the notoriously aggressive, venomous, and stealthy fer-de-lance snake; and the tiny but millions-strong and appropriately named army ant. Until 1983 visitors had to float down the Rio Viejo from the nearby town of Puerto Viejo de Sarapiqui to access the station. Now a two-hour bus ride from the nation’s capital, San Jose, drops off researchers, tourists, and students at what feels like a summer camp set in a tropical Yellowstone. Visitors get a glimpse of what awaits them when they drive by the forest-covered volcanoes of the Braulio Carillo on the way to La Selva. Each of the four graduate students and eight undergraduates traveling needed approximately $1,900 to participate in the immersion experience. They arrived November 27 with Armstrong, Distinguished Professor Steven Juliano, graduate teaching assistant Molly Schumacher, and this writer. The group enjoyed mostly hot and sunny days initially. Only when a storm started the night before Thanksgiving and lingered for four days did it become obvious why it is called a rain forest. Weather didn’t hinder the students, however, who were there to conduct research projects and experience the rain forest as biologists. They were permitted to research only plants and invertebrates, so as not to disturb the more vulnerable and less numerous larger species. Mardoian spent several hours a day monitoring a Senegalia Multipinnata plant in a section of La Selva known as the successional plots. This is an area in which sections are cut down annually and allowed to grow back in such a way that the forest can be studied in different stages of growth. 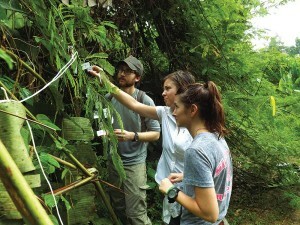 While small herds of peccaries foraged nearby and a green vine snake slithered among the brush, Mardoian conducted field research for the first time. He studied the relationship between the nectar-producing plant and the ants that eat the nectar. He hypothesized that the plant strengthens its defenses against herbivores by producing nectar that attracts the ants. Master’s student Meghan Strange’s project took her to the successional plots and beyond. She followed a web of concrete and mud trails that extended for miles into the forest to study web spinning spiders, including the golden silk orb-weaver, so named for its gold-colored web that is strong enough to pluck. Strange was studying why the spiders sometimes create a thicker white silk called stabilimenta, testing a hypothesis that they weave the more visible structure to keep nonpredators like birds from crashing into the webs. She prowled the rain forest, looking for, measuring, and then systematically damaging the webs as she went, before returning the next day to see whether the spiders responded by creating or enlarging stabilimenta. “Since my research back in Illinois focuses on a certain study organism (the house wren) on a specific study site, I think this kind of helps me to apply my abilities to do an experiment to a different area completely,” Strange said. Though neither Mardoian’s nor Strange’s results completely verified their hypotheses, the means were more important than the ends. “You can either learn about science passively or you can do science, engage in science,” Armstrong said. 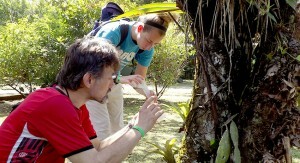 From left, Brandon Mardoian, Molly Schumacher, and Meghan Strange in Costa Rica. The team had ample opportunity to do the latter, as each day began at 6 a.m. or earlier, depending on whether the howler monkeys held an impromptu chorus. Students woke up, ate breakfast by 7 a.m., retired to their cabins for a brief siesta, and then headed out in small groups for a two- to three-hour hike in the forest that became a living classroom. Lunch followed at 11:30 a.m. After another brief break, when students lounged on hammocks or Skyped family and friends back home, they went out again for another long hike and to continue with research projects before returning for dinner. For many students the 15-hour workday culminated with a night hike. Every night, even in a downpour, the students strapped lamps to their heads and knee-high Wellington boots to their feet to protect against snakes as they searched for the hard to see. First-time visitors struggle to wrap their heads around how difficult it is to see animals in the rain forest. Many of the jungle residents live in the canopy. If it wasn’t for a La Selva guide pointing out the barely visible furry figure high in a tree next to the professors’ cabin, no one likely would have noticed the sloth. The rain forest can be incredibly dense with 160-foot tall, RV-wide sura trees; twisting vines; and innumerable varieties of palms that all block views deep into the forest. During the day, you may be able to see 30 feet in. At night, you’re lucky to see a hand in front of your face. The wild cats, like many of the animals, blend in to their environments so well that Juliano hasn’t seen one since he started coming to La Selva 15 years ago. Despite the darkness undergraduate Jennifer Achs discovered a young eyelash pit viper, a venomous snake, sitting atop a palm leaf only 5 feet from the path. Other students spotted several species of frog, a kinkajou, wolf spiders, a tarantula, and countless leafcutter ants marching in an endless cycle while foraging and feeding on fungus. The most enthusiastic explorer might have been Amanda Carter, a Ph.D. student originally from Virginia, who conducts field research on turtles for her doctoral studies. The diminutive Carter was one of the braver souls on the trip, joining a herpetologist from Tulsa University on a night hike with the stated goal of finding venomous snakes. The students who went on the trip agree the experience was invaluable in advancing their learning and career. Students were especially appreciative of the opportunity to partner with professors throughout the adventure. From sunrise to well past sunset, Armstrong and Juliano helped the students better understand their surroundings. When “class” started and when it ended was never clear. When they weren’t casually dropping knowledge, the professors were helping students with their research, like the morning Juliano spent with Zarifis collecting water samples from bromeliads. 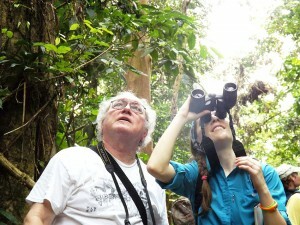 Armstrong has been studying tropical floral biology for decades around the world and has a doctorate in botany. He is the director of Illinois State’s Laboratory for Plant Identification and Conservation and the curator of the George S. Vasey Herbarium. Juliano was named Distinguished Professor in 2002 for his decades of nationally recognized research. He has a Ph.D. in zoology, a master’s degree in entomology, and a bachelor’s degree in biology. Armstrong and Juliano delight in sharing with the students a deep enthusiasm for learning and an awe of the rain forest and its inhabitants. Both professors are hopeful for private investment in the School of Biological Sciences that will further support students who want to take of advantage of the unique academic program. Editor’s note: Photos provided by Kevin Bersett, Rebecca DeHeer, Steven Juliano, Sarah Kluk, and Molly Schumacher. 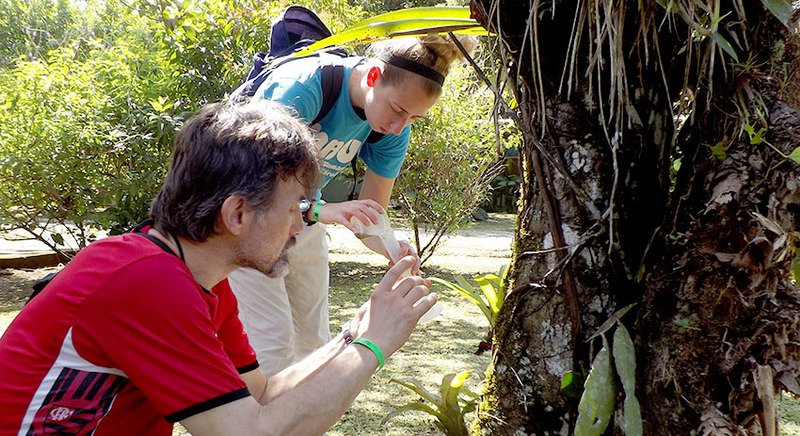 If you would like to support students who participate in future rain forest explorations, contact Development Director Stephanie Sellers at (309) 438-7725 or seselle@IllinoisState.edu; or School of Biological Sciences Director Craig Gatto at (309) 438-3669 or cgatto@IllinoisState.edu.